Image caption People are prohibited from "placing themselves in a position to beg or solicit money"
People caught begging, drinking alcohol or feeding gulls in parts of Weymouth face fines of £100 under new rules. A new Public Space Protection Order (PSPO), which aims to reduce antisocial behaviour, covers the promenade, town centre and some parks and squares. 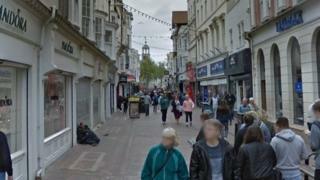 Weymouth & Portland Borough Council said the fixed penalty notices would only be used as a last resort. Councillor Mike Byatt said the council would "continue to be sensitive to people genuinely in need of support". Areas included in the alcohol ban include the promenade, town centre and railway station, Rodwell Trail, Chapelhay Gardens, Nothe Gardens and Easton Square, Portland. Feeding gulls is now banned throughout the town centre and promenade, while begging is forbidden in the town centre, from Westham Road to Town Bridge, from the river to the seafront. Byelaws already prohibit begging on the promenade. The fine of £100 must be paid within 28 days but is reduced to £75 if paid within 14 days. Human rights group Liberty has criticised the use of PSPOs, saying: "If someone is forced to beg, that's not antisocial behaviour - that's extreme poverty." Mr Byatt, who is responsible for community safety at the council, said: "We understand the difficulties of situations that lead individuals to begging, and will continue to be sensitive to people genuinely in need of our support. "However, fixed penalty notices will be available if there is no other alternative to tackle the problem." The new PSPO, which remains in place for three years, also bans cycling on the town's promenade between 10:00 and 17:30 between Good Friday and the end of October.